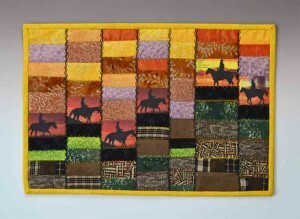 I spent quite a long time developing this quilt from my photos in Yellowstone last October. It comes from a close-up of water in the Grand Prismatic Pool. I worked with Photoshop filters to discover more design in the patterns. One of the iterations created a kind of plaid effect, and all of the photoshop filters found a tremendous range of color in what appeared on the surface as golden sparkles on a brown background. I thought the hand-painted silks in the center would combine best with gray, but the green and red worked out much better. 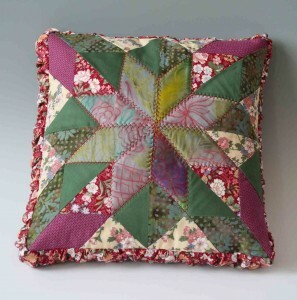 This traditional quilt block is striking enough to stand alone as a boudoir pillow. 14″ square. 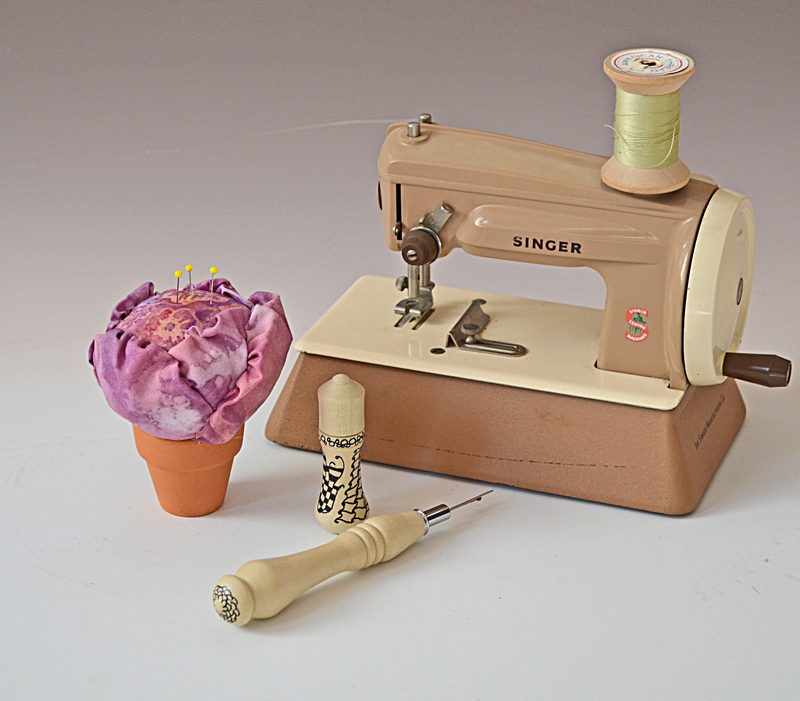 In addition to quilts, I always include some notions in our inventory of fine crafts. This year, I had variegated fabrics for the cabbage pincushions. They also have walnut shells inside (provided by my friend Toni Pollard) to keep the needles and pins extra sharp. The seamrippers will have lots of new wood options, and a wide array of shapes to fit every size of hand, including XL. This bear has been in two Studio Tours, and will need to be marked down this year, but all of the other softies are new work from 2015. 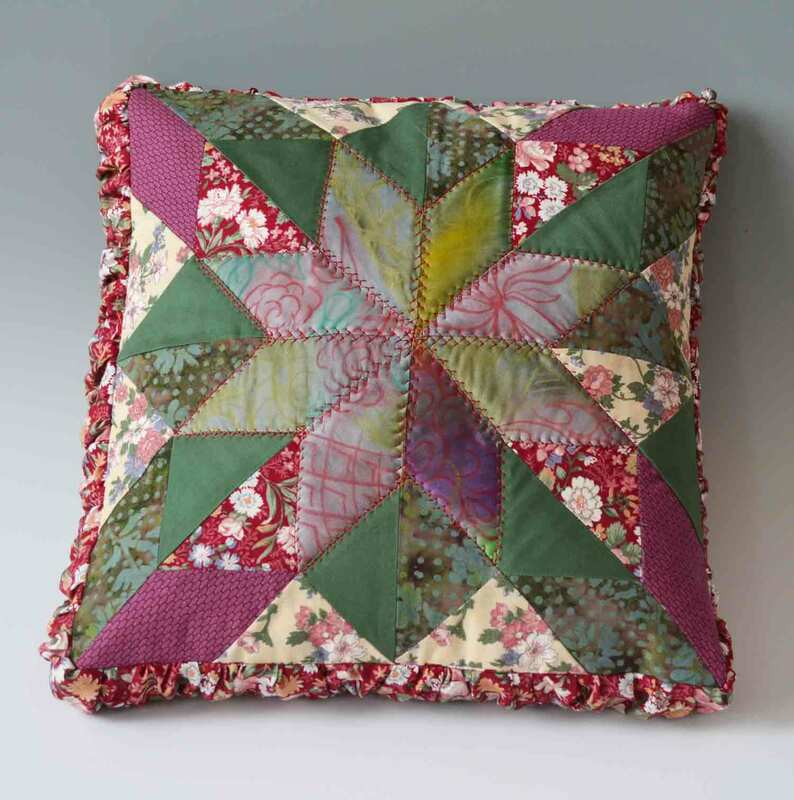 It has been fun to use quilts in 3D formats. 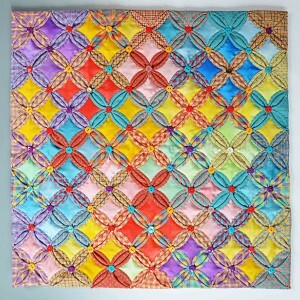 Now that many folks are downsizing, we have to get quilts into their lives any way we can! Dennis and I have a house full of new work for the 2015 Tour, and our other shows leading up to Christmas. I will have coloring on fabric available all day for visitors to try out some of the new products for drawing and painting on fabric. Our stop also features wooden ornament blanks and wooden eggs for the other artists who stop by. We’re here to celebrate and invoke the power of making! September 12-13 at our house, 19930 W. Top O’ the Moor in Monument. We haven’t experienced fires and floods this year, but the cold, rainy weather took away even our usual three days of Spring. I was sitting in the sewing room during a big hailstorm on the 28th of May, sorting scraps. These fabrics jumped up and merged together with a reminder of the color and joy of our usual May weather. Oh, well, at least there is lots of water, and the little Spring Peeper frogs are singing away madly in the pond, trying to stay warm. This and other micro-mini quilts will be our Studio Tour in September. They are the quilter’s version of sketches. All are matted in a 9 x 9″ format that fits an inexpensive IKEA frame. 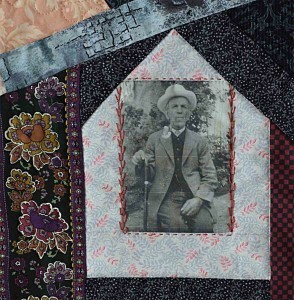 Quilting has wonderful traditions of recycling, remembering, and rejoicing in a wonderful heritage. For the studio tour this year, I have been revisiting the Crazy Quilts from the 1880’s. They have a great deal in common with Art Quilts: inventive design, collage techniques, ‘fancywork,’ use of popular images, and a decorative purpose. They were not made to cover a bed. And pets never slept on them–too many buttons and embellishments. This section of ‘What they are wearing’ features a patriarchal ancestor framed by a house shape. My embroidery skills are minimal by 1880’s standards, but our fabrics are more exciting. I also used free motion machine quilting. I’m certain that it would have been used for the old quilts had it been available to those quilters. We also have better image transfer techniques that make it possible to capture some of the quality of old black and white photos. Much easier than using kerosene and a spoon! The Tour is September 13 and 14th. If you stop by our house, you can also see great woodturning from Dennis. For more information about other artists, go to the Front Range Open Studios website for a map and links to their information. The Colorado members of Studio Art Quilt Associates have a show of small work at TACtile gallery in Denver July 11-September 2nd, 2014. ‘Small Vision, Big Voice’ features new work by SAQA members less than 24″ in any dimension. The gallery is open afternoons Wednesday-Sunday at 1307 Bannock St. in downtown Denver. 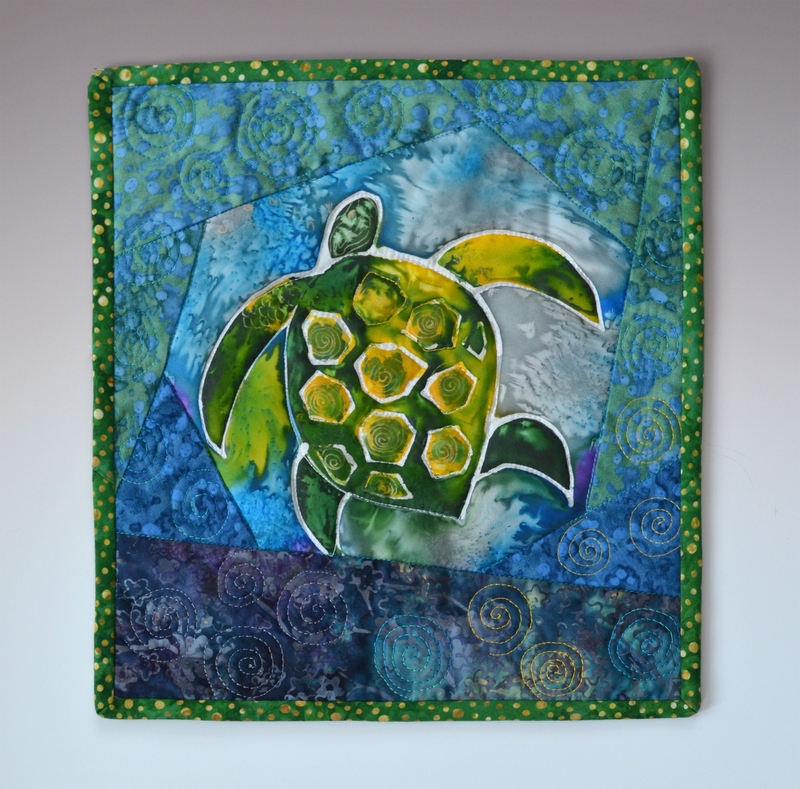 Sea Turtle is a silk painting with batik borders. 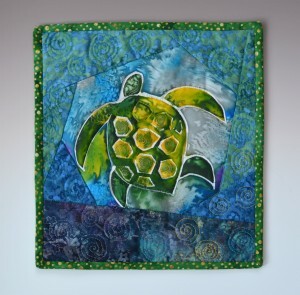 I have been working on a series of work in both quilts and woodturnings incorporating fish and turtles. All of this work will be in the Studio Tour in September. Quilting has its own fashions and fads. Crazy quilting comes out of the Victorian excess of velvets and laces, combined with the development of ways to process photos onto fabric. Dying lace in old tea gives a perfect cameo of resourceful women using up all of their little treasures. 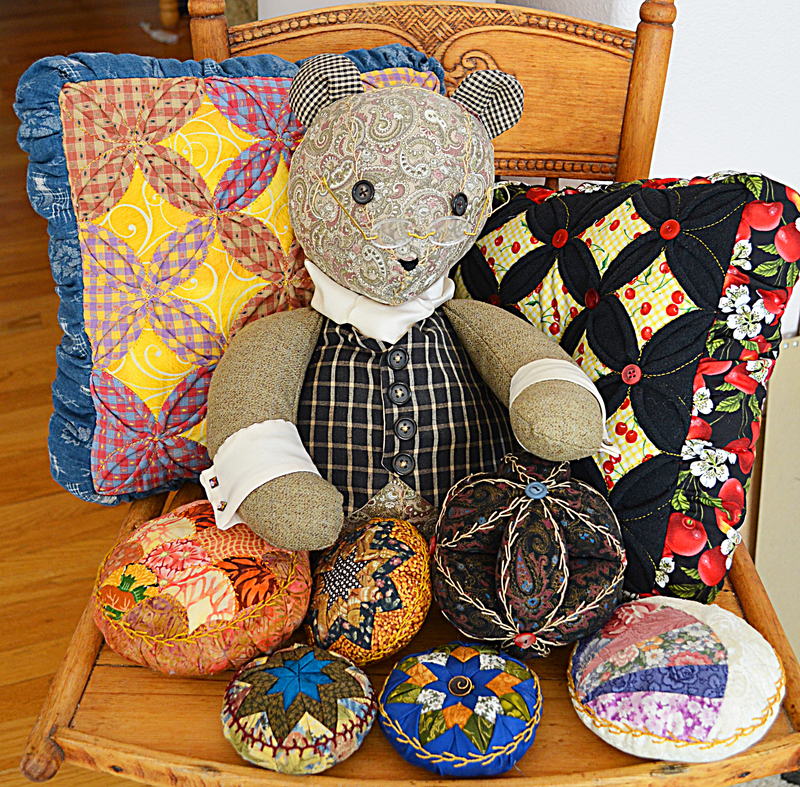 This year, I am revisiting crazy quilting with updated fabrics and available sewing technology. Our culture is obsessed with images, so I am using images from art history, commercial art, and family photo albums as design elements. The first ‘sketch’ quilt in the series is ‘Living Large,’ which is a 12 x 12″ quilt. It uses a cubist painting by Gino Severini, 1912, which added sequins to the composition over 100 years ago [Dynamic Hieroglyph of the Bal Tabarin). Divided and reconfigured with fabric, embroidery, lace, and a handmade buttton, it emerges here as the anchor of an image and font-rich quilt. Purple Sage 15 x 21"
We are on our way to the Utah Woodturning Symposium. This little modified bargello-style quilt combines printed cowboy images with the colors of the West. It is machine-pieced, and outline quilted with machine embroidery stitches. I embroidered the black feather stitches in memory of my pioneer Grandmother Ambrose. She sewed, crocheted, and embellished with tatting, but the feather stitch was always her favorite. Why are Art Quilts small? 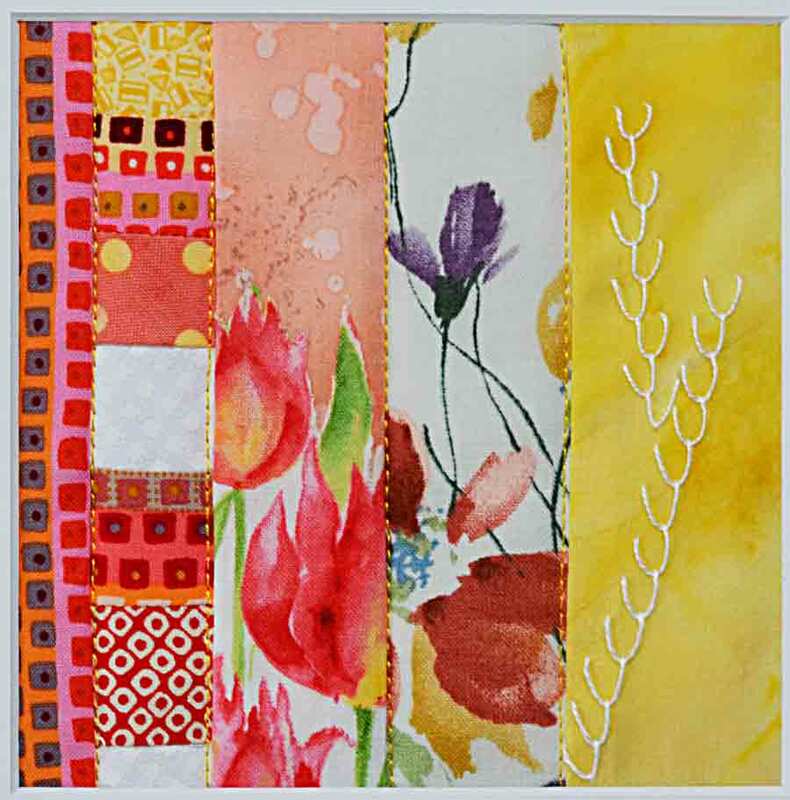 Surface Design Journal’s reviewer recently commented that art quilts are getting smaller, as she reviewed a gallery show. Of course, if you need to fill a king-size bed, or a giant wall, you will need a big piece of art, possibly a quilt. In a time when many of customers are down-sizing their homes, it seems logical that we might choose to make smaller quilts so that we can sell them! There are also reasons that have to do with making the quilt, as well as selling it. First, art quilting is a more experimental size of quilting. 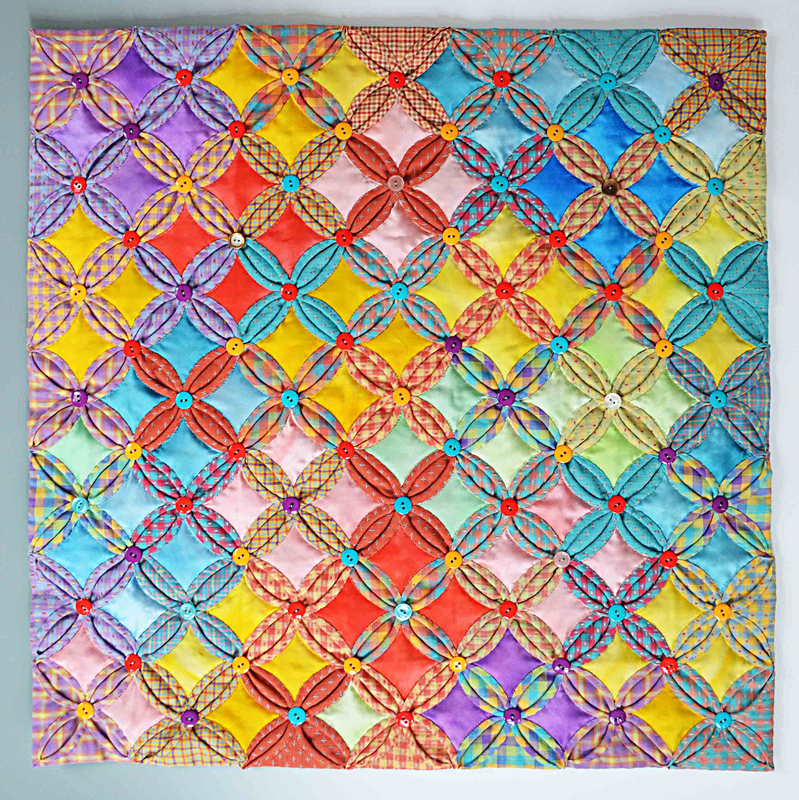 Many small quilts allow us to explore composition and color in a variety of ways. We may be more imaginative with our version of ‘sketch’ that we would be with an heirloom-size quilt. 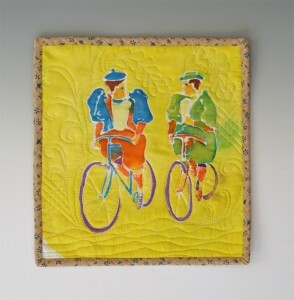 A smaller piece also prompts the viewer to ask what about the work makes it a quilt. This is one of the primary goals of art quilting–to draw the definition of quilting to the process of making it, and not to its relationship to a bed. Parameters defined by the process of making also govern our choices of size. 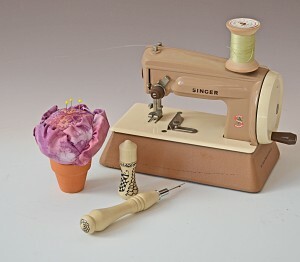 Our sewing tools are designed for accuracy in detail. We draw on a small area because our version of the brush–the stitch–is inherently small. 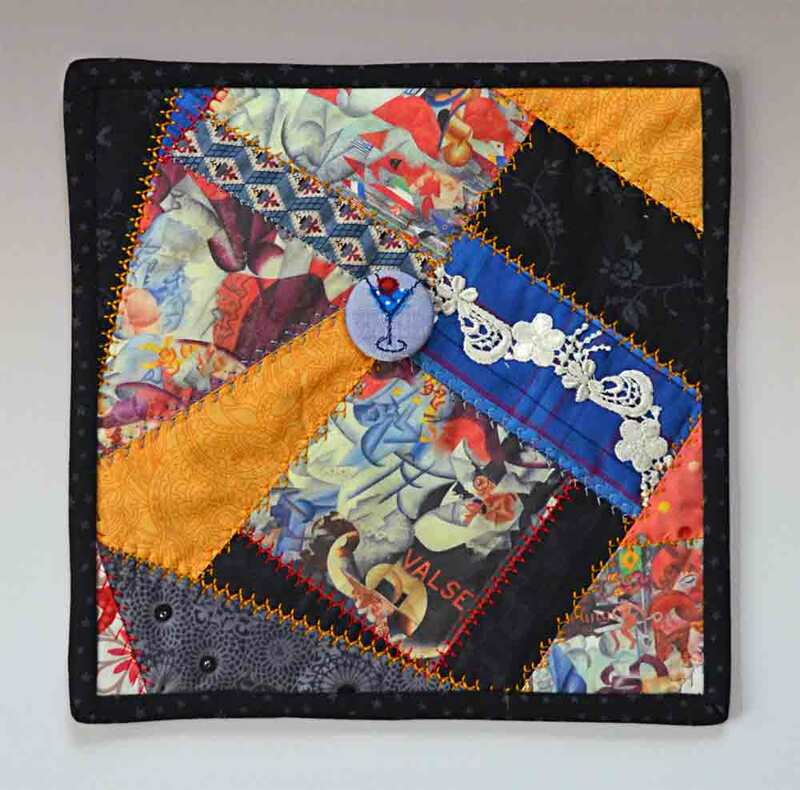 Quilts have a very personal tactile appeal, maybe more like jewelry than like paintings. I rarely hold a painting, even a favorite one, in my lap. Posted in Drawing, Fiber, stitching | Comments Off on Why are Art Quilts small?